As soon as I got my first Oh My Heart box in the mail (and after dancing around the house a bit ;) I got straight to work making pages for my booth at CHA! JOURNALING SAYS: Even though you're 4.5 years old it seems like I'm always carrying you! Haha! Well, it is much faster to get from point A to B if I hold you and you let me so I'm gonna keep on! 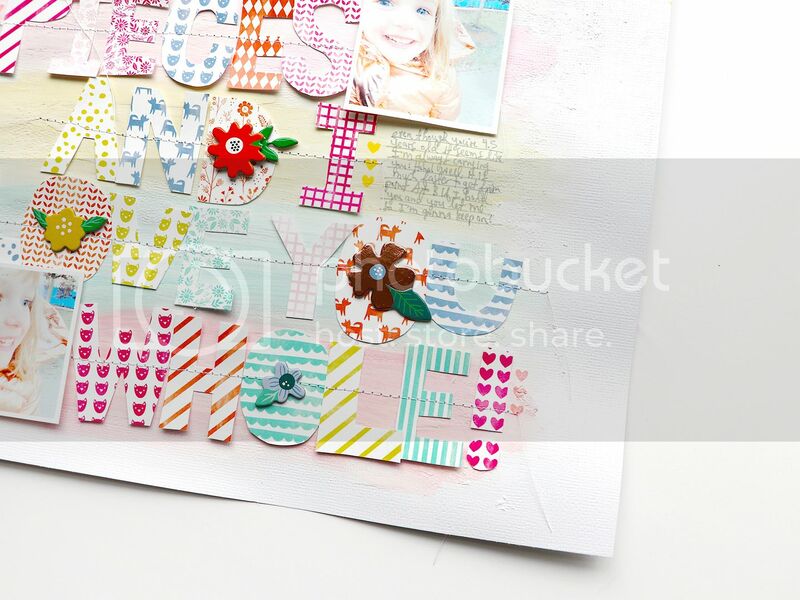 HOW TO: Prime a white cardstock background with a layer of modeling paste and let it dry. Watercolor (matching the colors of Paper 24) stripes down the center of the page. Once the watercolors are dry, whitewash over it with white acrylic paint, and let it dry. Free hand cut a long title from the patterns of Paper 24 then figure out where you want them. Stitch each row of letters in place and gently bend up the letters for dimension. 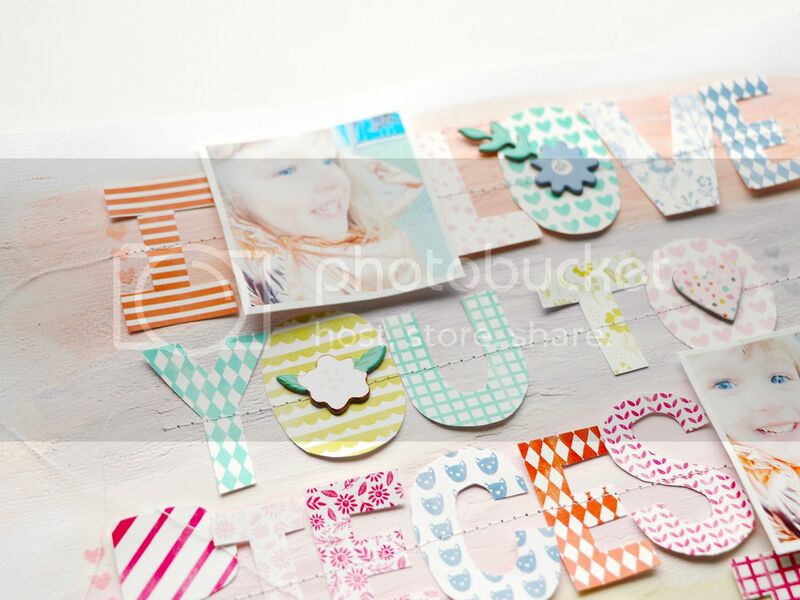 Adhere three photos and embellish the centers of the open letters with chipboard flowers and a heart. At the beginning or end of each row, stamp a matching colored trio of hearts. TTFN - ta ta for now! Ohhhhhhhhhh I love love love this! LOVING those colors and the way you did the title!!!!!!!!!!!!! 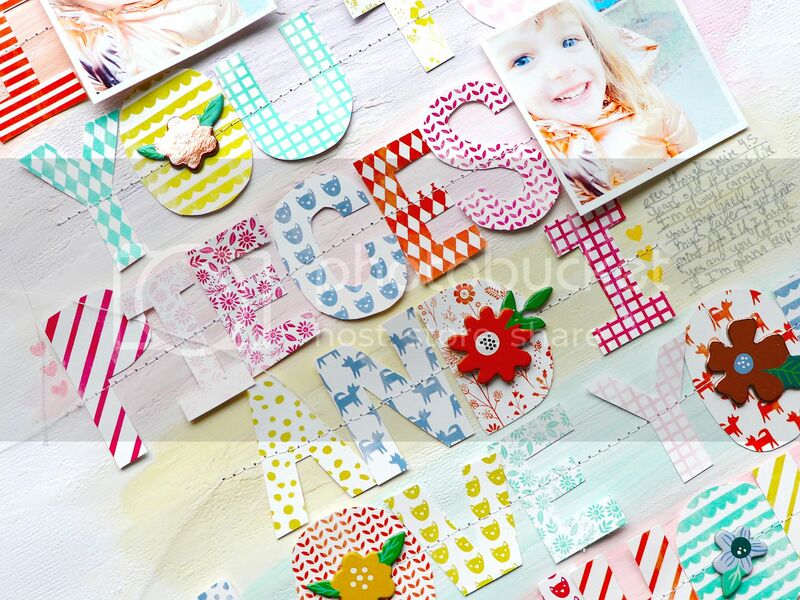 I love this, and what a great way to use the square patterned papers. Adorable!! Love the papers in that sweet title! !